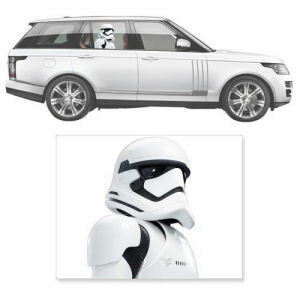 We have Just Sold out of Star Wars The Force Awakens First Order Stormtrooper Window Wrap Passenger Series Car Decal. Not to Worry! Fill in the Notify me When Available and you will be the first in line for our restock of Star Wars The Force Awakens First Order Stormtrooper Window Wrap Passenger Series Car Decal !! From the Star Wars collection by Fanwraps. Star Wars The Force Awakens First Order Stormtrooper Window Wrap Passenger Series Car Decal. The passenger series of automotive decals from FanWraps showcases a life-sized character head applied to the window. The graphic is partially see-through and diffuses the suns ray. Main graphic size measures 13 inches by 16.625 inches.